You may have noticed I took an unexpected and unannounced two weeks off from these write-ups. That’s because two weeks ago my wife was in labor, and now we’ve got our very first offspring. Hurrah! Needless to say, I’ve been a bit preoccupied with more important things. 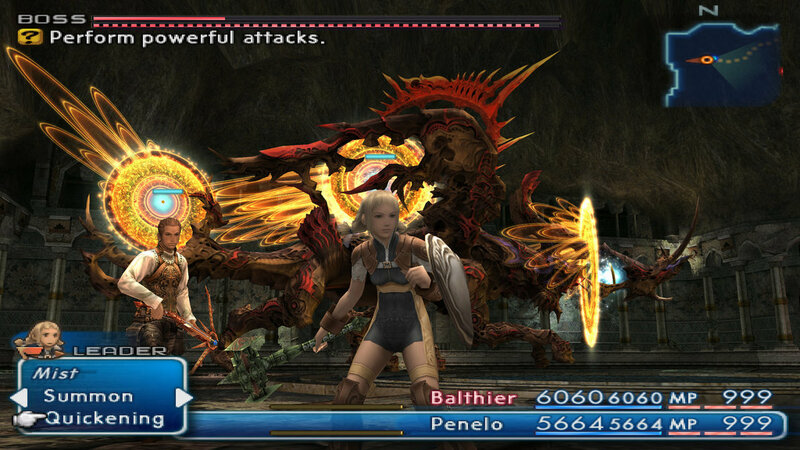 All that aside, I was able to get back into Final Fantasy XII this week a bit, inching closer and closer to the finale. Yes, I am still playing the game I started playing way back on October 11. It’s ridiculous. Even so, I persevere. The reason for the slog isn’t just my real-world obligations, but also the sheer length of this game. So far I have put nearly 55 hours into Final Fantasy XII, and I reckon I’m still five to ten hours out from completing it. For perspective, the two games in this series that took me the longest amount of time to complete to date were Final Fantasy X at around 49.5 hours, and Final Fantasy II at about 46.5 hours. Those are both start-to-finish times. Once I hit 60 hours that’ll be more than 10 hours longer than the next longest. It’s really, really long for a typical Final Fantasy, and the slog of walking from place to place to place that I have complained about previously has unfortunately not let up any. In brighter news, I know (thanks to the guide I have decided to consult due to how long this game is taking) that I am just around the corner from finally wrapping this game up for good, so I should be able to smash it out by next week’s write-up and get started on Final Fantasy XIII. Sadly the Guinness World Record attempt I mentioned last month has gone out the window; obviously with a newborn baby I just won’t be able to attempt that right now. Perhaps in the future sometime, but it won’t be a part of this marathon. But hey, Square Enix has got a special trial offer for Final Fantasy XIV in the month of December: new players who sign up can get four free days of playtime. Maybe, just maybe, if I can manage to sprint through FFXIII in a couple weeks (unlikely, but I can try!) I’ll be able to dip my toes ever so slightly into the world of Eorzea before the year has wrapped. Fingers crossed. Getting back to Final Fantasy XII, there’s honestly not much more to say. The game is still moving slowly along, and I’m becoming less invested in the plot the further along it goes. I enjoy the world and the hunts, but have not time to properly explore as I would like. The battle system is still solid, and I still enjoy the licenses. It’s the same stuff you’ve heard me talking about for a month and a half now, so no need to tread water by revisiting it all again. Hopefully I will have more to say next week, when I should have the game wrapped at long last. As always, follow me on Twitter and watch the #RoadtoXVin15 hashtag to watch my live tweeting of the remaining games!